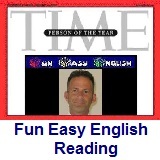 ﻿ Fun Easy English - reading practice and learning about the holiday Passover. Passover, or Pesach (from: פֶּסַח in Hebrew, Yiddish), Tiberian: [pɛsaħ], Modern Hebrew: /ˈpesaχ/ Pesah, Pesakh, Yiddish: Peysekh, Paysakh, Paysokh) is an important Biblically-derived Jewish festival. The Jewish people celebrate Passover as a commemoration of their liberation over 3,300 years ago by God from slavery in ancient Egypt that was ruled by the Pharaohs, and their birth as a nation under the leadership of Moses. It commemorates the story of the Exodus as described in the Hebrew Bible especially in the Book of Exodus, in which the Israelites were freed from slavery in Egypt. Passover commences on the 15th of the Hebrew month of Nisan and lasts for either seven days (in Israel) or eight days (in the diaspora). In Judaism, a day commences at dusk and lasts until the following dusk, thus the first day of Passover only begins after dusk of the 14th of Nisan and ends at dusk of the 15th day of the month of Nisan. The rituals unique to the Passover celebrations commence with the Passover Seder when the 15th of Nisan has begun. In the Northern Hemisphere Passover takes place in spring as the Torah prescribes it: "in the month of [the] spring" (בחדש האביב Exodus 23:15). It is one of the most widely observed Jewish holidays. Passover is a very important Jewish holiday. The story of this holiday is really interesting and the food served during the Passover meal is different than the food eaten during the regular days of the year. 1. Passover, or Pesach is which of the following? 2. Passover commemorates which of the following? 3. Passover commences on the 15th of which Hebrew month? 4. Passover celebrations commence with which of the following? 5. Matzo is what type of food?